Dr Berg, who’s dedicated to provide free of cost health education and advises to the common people, has come up with yet another interesting and informative video about intermittent fasting. His lucid and catchy style attracts many. When dealing with intermittent fasting, he has tried to explain about it, and how gradually you can embrace that system of eating which involves long hours of fasting! It all seems to be simple, in the first go. However implementation is difficult, when he leaves the door open for you to try for yourself and for how much time you can bear the fasting! There are mixed reviews for his suggestions and schemes. There are plans available which guide you completely and push you on a well defined and flexible track of intermittent fasting, with assured results too. So, find at trustworthy plan, provided by a guide who himself is a testimony to it. Abate all perplexities that might lessen your determination! First of all let’s find out who Dr Berg is? Eric Berg, DC, 52 years of age is a chiropractor who specializes in weight loss through nutritional and natural methods. His private practice is located in Alexandria, Virginia. He has been in practice for 25 years. At his clinic he provides consultation to patients in eating better, how to get nutrition from the foods we eat and using nutrition to improve health. He has taught nutrition part time at Howard University as an associate professor in the Community Health division and delivered many educational seminars to government agencies as well as creating health YouTube videos online. A chiropractor is a health care professional focused on the diagnosis and treatment of neuromuscular disorders, with an emphasis on treatment through manual adjustment/manipulation o the spine. Chiropractics is generally recognized as an alternative to medicine or complementary medicine. What made him deviate from his main profession? Dr Berg at one point of time was himself battling with health issues! When medications could not provide any benefits, he realized that it were his reckless eating habits that led to all the problems! Thus, during his struggles to combat his deteriorating health, he realized the value of healthy eating! Around the age of 32, Dr Berg started studying nutrition intensely, quit his full-time chiropractic practice, and delved deeply into food therapy, acupressure, and alternative techniques. He is the author of The 7 Principles of Fat Burning, published by KB Publishing in January 2011. He says, “It’s getting healthy to lose weight and not lose weight to get healthy!” Thus you can fight obesity, the root cause behind most of the diseases by healthy eating. So, what he provides is tailored solutions for your body type, exclusively by paying a visit to his clinic! Apart from this, he provides health education, to average people, thus making them aware of prevalent health problems, answers to queries related to diet, digestion, fat burning, hormones and more. Relevant videos are present on his website and are uploaded on you tube too. His website serves as an online health and wellness solution, where he provides a variety of services, apart from educational videos. It also provides access to some healthy recipes that you may benefit from. He sells a variety of overpriced health supplements on his website, claiming them to be naturally pure and effective (yet they are not FDA approved and have not undergone any laboratory testing). A one to one virtual consultation service that operates via skype is also provided such that you may get an overview of your health issues, of course not completely. Thus finally you may end up at his clinic, for therapies that his trained practitioners might prescribe! This can of course be heavy on your budget! For losing weight, he promises to provide customized eating plans with special nutritional recommendations! But you should be sure that it’s not possible to have the right diagnosis done without seeing the professionals. So you will need to pay him a visit, or may be visits. Some people’s experiences do owe to the fact that his therapies and advices were wonderful, and changed their lives, while there are some who found it as a useless bargain. What he offers at his clinic? Along with dietary advice he uses acupressure techniques, massages etc to destress you, so that cortisol (stress hormone) levels may be lowered. Lower cortisol (stress hormone) levels lead to increased growth hormone and Igf (insulin like growth factor) which that may trigger weight loss! Finally, we can say that his advises are beneficial and his way of putting things across is simple yet informative. You can benefit from them but we all know if your weight is too much, you need a fully fledged plan to lose pounds and be the dream person we want to be! Dr Berg in a short video has tried to explain how intermittent fasting can lead to weight loss. Owing to the fact that lower cortisol (stress hormone) levels lead to increased growth hormone and Igf (insulin like growth factor) which that may trigger weight loss! Fasting or long durations of no eating, leads to lowered cortisol levels, thus aiding in weight loss. He educates about how it works, why it is necessary, as whenever we eat we spike insulin, breaking the myth that when we eat carbohydrates only then we spike insulin. This is why we seriously need a fasting window, for serious fat burning! He says it should be a gradual process, of recovery. Move from five meals a day, to three and then two, increasing your fasting window, from 8 to 12 and then 20 hours, which includes your sleeping time at night. He advises you to reducing the number of meals you take in day, and increase the non eating span. Thus, train yourself you to bear it little by little. Like all his videos, he puts it forward in a simple and attractive manner. It seems to be easy to follow, but there is a little effort on your part to do more of digging about it. Make diet charts yourself, plan out your meals, and do the drill as and when it may suit you. And if you need any more information about intermittent fasting, or any query comes in your mind, you need advice and guidance again! Of course his advice is useful but not a complete solution for one and all. Find out a plan that is COMPLETE, target oriented and well laid out. So, you may not be perplexed and lost. Sponsored: Why “Eat Stop Eat” diet plan is the perfect way to kickstart with “intermittent fasting”? 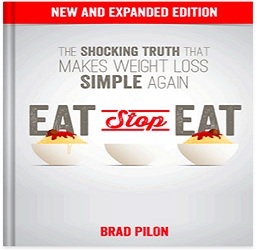 Eat stop Eat, is a diet plan developed by the diet guru, Brad Pilon, who understands the psychology of a dieter and has made it flexible enough, not to interfere with your energy levels, or hinder your daily work schedule. You might be curious to know how? Intermittent fasting is the basic approach that he follows but in a better way! There are many approaches to intermittent fasting like, 16/8 approach, 5:2 diet system, alternate day fasting etc. This plan by Brad Pilon is like a breath of fresh air, in the crowded market of dietary approaches. All you need to do, is to eat healthy to satisfy your tummy, but insert a non eating window (fast) of 24 hours once or twice a week, however it may suit you, or your body may be able to cope with. This diet promises to offer you all the health benefits that any intermittent fasting plan would. Fasting for as little as 24 hours has been shown to drastically reduce your insulin levels while increasing your Growth Hormone levels. No need to worry that whether or not will you be able to fast for complete 24hours or not! Brad Pilon in his plan, even relaxes that for you. There is still a benefit to fasting for 16 hours, just as there is no real harm in fasting for 30 hours. With Eat Stop Eat here is no mandate to stop eating the foods you love, to clean out your kitchen or to never eat carbs or fat again. What makes this different from Dr Berg’s plan? First of all, you should know that Dr Berg has only provided advice regarding intermittent fasting. He has not provided any plan. He has asked to gradually increase your fasting window from 8 to 16 hours or more! That’s all! Out of many approaches to intermittent fasting he doesn’t point out on any one, that you may embrace leaving you to keep on trying to increase the non eating span. Whereas eat stop eat has an edge over all other plans which are specific and detailed but were found to be rigid and hard to follow. Brad Pilon has provided a specific plan, with flexibility too! You know what to do during you’re really easy and flexible journey of weight loss. All days during the week will be your normal days except the days on which you fast. And the fasting days will be one or maximum two. No low calorie recipe to be learnt, no extra shopping for fasting days. Brad Pilon has made it simple for you to the extent that the plan never interferes with your work schedules. Do you know which approach did Dr Berg follow? When you follow something, you need it to be backed by conviction and goodwill. Dr Berg has provided advice, but not revealed whether he tried intermittent fasting himself or not? And if he did, which approach did he choose to follow? You must agree that the best advice comes from the one who has tried and tested the plan himself. Coz only he would know where you might lag, where you need support etc. Eat stop eat is a plan that the author had followed and achieved amazing results! Dr Berg has not written a book or given any detailed and specific plan! His informative video can be an additional support for you, may provide you help to prepare your body to embark on this journey. But it’s not any tool or plan as you may call it, to keep you going until you reach your goal! Buying a book will cost you some dollars, but it’s worth it! Free yourself from being occupied with thoughts like how much to eat, when to eat and when not to. Counting the no of hours or calories or preparing meals etc. Find yourself liberated and free! This plan also prevents your weight from rebounding back, as it is a more resilient approach to intermittent fasting. When any plan is user friendly, you have maximum chances of sticking to it! Adopt it as a lifestyle and reap the benefits! Your queries related to hormones and what would happen within your body, precautions etc have also been finely written in detail in his book. Be at peace that you won’t wander in the dark. Eat stop eat provides flexible guidelines! There isn’t any need for a unique approach for any new person since Brad says that fasting can be once or twice a week and that too according to your ability. Dr Berg’s tips and videos help create awareness, educate people, but you cannot do any drill yourself! What he promotes is going to his wellness center for a unique and customized diagnosis and remedies that he would provide you with, claiming to be a natural remedy giver! He says that no single program can solve everyone’s problems, thus paves the way for people to his clinic, to get his expert advice. Bank on this very fair enough deal. With eat stop eat you get a complete money back guarantee within a span of 60 days, if you fail to see the results. This is enough to boast about the plan. They provide you a free starter’s guide along with the diet plan book. Read his book, to know what Brad Pilon claims and implement it to reap the assured benefits! Dr Berg is amazing! He has totally changed mine and my families’ lifestyle only for the better. So many questions have been answered about how to live a healthy life by him. All the products that I have tried by him are high quality. I love all the information he shares and will follow him for the rest of my life!! One of the best Doctors in the world when you need real prevention and cure for all types of diseases naturally. He knows everything about nutrition and health. Ketogenic diets and so much more. His opinions and videos are extremely helpful and a complete guide to the everlasting well-being. Don’t waste your time. All they want is to make more $$$ off of you. They will direct to you their program which costs around $2200 for 3 months and buy their supplements where I can get from an Organic Market. After I said “I will think about it,” the doctor didn’t even acknowledge me after I left. There is no way I am going to this jerk again. He took my money and kept me waiting for the appointment. I tried asking him about the dates and he gave me another one. After I paid, I have been with only two sessions. Those were also not satisfactory. They did not make any difference my prevailing health condition.